I repeatedly read of DSG gearbox issues affecting Volkswagens and Audis. Why not cleared up by now? 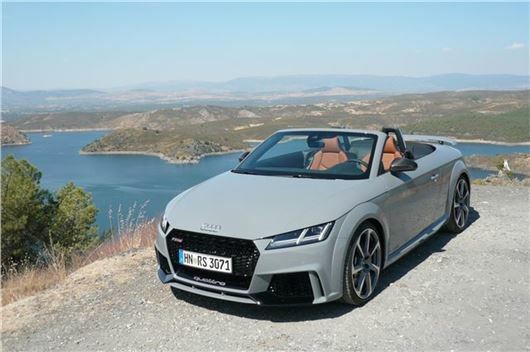 Thinking of a new Audi TT auto. Wanting a coupe smaller than my current Mercedes 2.2 auto C class coupe which is very good but a bit to long in my declining years. Should I buy petrol or diesel? Or maybe an Evoque as it is shorter? The DSG/s-tronic problems are mainly with 7-speed dry clutch DQ200 boxes. These are not and were never fitted to any TTs. The most common DSG/s-tronic in a TT is 6-speed wet clutch DQ250 that is reliable but can 'take over', not always downchanging to the gear you want. The best is the newer, high torque 7-speed wet clutch DQ500 as fitted to RS3s, TTRSs, Q3s and the very latest Golf R (that was awful with the DQ250). The wet clutch boxes need a change of fluid every 3 years, but that's a job made so easy a DIYer could do it. Do you have any obvious comments on a 2008 Mini Cooper S Clubman. It’s red with an air-intake on bonnet, black alloy wheels and what look like low profile tyres and suspension to match. Looks good - don't know the mileage. Just some basic pointers if you can. It's the model with the 'half door' reverse-opening access for back seats. Talking to my dealer today, he tells me that the Prius plug-in, once the battery runs out (putting it in the same position as the normal Prius), does not regenerate through the braking system like its brother, just reverts to a petrol engine car. Now I don’t profess to know much about these things, but that makes no sense to me at all. Indeed, what little I do know makes that statement totally illogical. Tell me please, is that correct? it surely can’t be. I want to buy my first SUV. I live in Pakistan. My budget allows me to either buy a Japanese Toyota Prado 2008 to 2009 model Tx 4.0 Litre, or a Japanese Toyota Prado 2010 model 2.7 Litre, or a Pakistani manufactured Toyota Fortuner 2017 2.7 Litre brand new. Which one should I buy? The Fortuner is a fairly crude Hilux pick-up based SUV built in South Africa, Pakistan and Thailand that does at least have rear coil springs. The 2.7VVTI is a petrol engine. The older Prados are simply older versions of the same thing that have probably had a hard life. So no reason not to go for the new Fortuner. I noted your reply on cloned number plates. How you put up with yet another letter saying "I was forced by faceless liberal elites to buy a diesel, the Daily Mail told me" I don't know. The rush to electric cars is going to make the diesel business look like a storm in a teacup. My point is that I had a similar cloned plates problem many years ago with a G reg Honda Accord. There were some lads on the rob in a Prelude who had cloned the plates. If your correspondent passes the letter from the parking body onto the DVLA, they will supply a new date related registration for nowt. It avoids odd questions about "is it an Irish import" when selling on. Many thanks. This is the first I have heard of the DVLA doing that without any problem. I've been getting a fair amount of the opposite. I’ve had three BMW 330Ds on the trot. A fantastic car, but the mileage means I’ll have to change soon. I’d buy another, but they’ve got longer and wider while parking bays get shorter and narrower so what’s the Japanese, Korean or Swedish alternative please? The BMW equivalent is a 2-Series coupe: a 123d M Sport or the ferociously fast 240i M. Japanese equivalents such as the Lexus LC are spectacular, but longer and wider still. Same goes for the new KIA Stinger. No Swedish equivalent. I could not agree with you more about your comment concerning German cars: “merely an illusion of better quality”. In 1989 I bought new a Mazda 626 estate. I scrapped it in 2012 after 23 years’ reliable service and 140,000 miles. There were no breakdowns and only 3 repairs needed: a new brake calliper; a new diaphragm in the carburettor; a bit of welding on the sill in year 22. In 2007 I bought a new BMW530i. It is now 10 years old and has done 41,000 miles. It has “broken down” too often to count, including once being taken to the local BMW dealer on a low loader. Besides the BMW recall “enhancements” it has also needed the following additional repairs: a new gear lever; a new low pressure fuel sensor; a new high pressure fuel pump; 6 new fuel injectors; 3 new oxygen sensors; 6 new spark plugs; a fluid and filter kit for a leaking mechatronics sleeve in the ZF automatic gearbox. Only the gear lever was covered by warranty. I will let you guess how much the other repairs cost in total. Should I sell the BMW now or try and get say 5 years more life out of it? I've found that after 5 - 6 years of constantly needing replacement parts, German cars can settle down. But that was in the past. These days there's a lot more to go wrong. So I'd get out, if you can, into a KIA, Hyundai, Toyota or Lexus. I bought an Alfa 4C in November 2015 from a South London dealer and took it to the local Alfa franchise in January this year for the 12 month service (costing close to £1,000 due to the fact that the carbon chassis had to be completely deconstructed and rebuilt). This was compulsory to avoid invalidating the warranty. Today I received a letter from them claiming that the brake fluid now needs to be drained, flushed and refilled and the car should be booked in for this to be completed. No price was quoted. This seems unnecessary as it should be dealt with by the service schedule. Sounds like a rip-off. Also I would rather take the car to the local independent garage. Surely nothing wrong with that. Please offer your opinions on these matters. It only needs a brake fluid change if the brake fluid is contaminated, and this can be tested for. But I can't understand why it needed a rebuild of its carbon fibre tub costing £1,000. Unless it was bought 2nd hand and had been damaged (by an off-track excursion), this should have been covered by warranty. While the engine is FIAT and familiar to FIAT and FIAT/Abarth dealers, the rest of the car is too specialised for a local garage and there may be TSBs you would miss by not taking it back to Alfa. I'm looking at purchasing an ex-rental 2016 Mazda 3 SE-L automatic that has clocked 35k miles. Anything I should be concerned about or watch out for? Price is £10,600. Can you tell me, please, if the 1.2T petrol Auris has a cam chain or belt. I have a 4-year old Skoda Rapid 1.2 TSI manual. I want to stay with Skoda But not another Rapid: far too noisy and bad suspension. I have been considering either an Octavia petrol auto or a Yeti petrol auto. Are they any quieter and more comfortable than the Rapid? Unless 4WD they have the same basic twist-beam rear suspension. The Rapid Spaceback and the Fabia work better than a Rapid because less rear overhang. Octavias are best on 16-inch wheels with 205/55 R16 tyres. The problem with the autos is that all of them with 1.0 litre to 1.8 litres are 7-speed dry clutch DG200 DSGs that have been and continue to be a lot of trouble. If you want a decent small automatic the best is a Mazda 2 6-speed torque converter auto. You kindly answered a question from me recently about wheel sizes on the Toyota Auris. I purchased a new Excel grade Tourer as it had particular features I wanted, but it came on 17-inch wheels as standard and the dealer was unable to get this changed. I prefer 16-inch wheels for various reasons and, as suggested by you, planned to fit these with Michelin Cross Climate all season tyres. I asked Toyota Customer Services if this would affect the integrity or warranty of the vehicle in any way and requested the part number of the 16-inch wheels that are standard on most other grades of the Auris. Toyota ignored my warranty question but stated that the Excel vehicle is approved for driving in the UK with 17-inch wheels and therefore they could not recommend anything else. I am not prepared to risk compromising my warranty, so now plan to fit 17-inch Cross Climate tyres on the standard wheels, but I have failed to find any useful information on how the Homologation/Type Approval process actually works. If a Certificate of Conformity has been issued for a particular configuration such as this vehicle grade with 17-inch wheels and I was to fit 16-inch, would it actually be illegal and therefore I would run the risk of not only invalidating my warranty but insurance as well? Cars are Type Approved with specific wheel and tyre sizes. That means franchised dealers can't change those wheels and tyres for a different size, however sensible the change may be. With your insurer’s approval there is nothing to stop you changing them. Doesn't make the car illegal and is unlikely to affect the warranty, but Toyota dealers have to stick by a very rigid Toyota rule-book. I need to buy a new car. Price anything up to £30k. Reviews of recent releases (Vovo XC40, VW T-Roc, Audi Q2 ) suggest they are more gizmo than actual car and the toys probably cost more than the basic essentials to which they are attached. If I want a basic car that gets me from A to B without singing and dancing (say as a Morris Minor did), which makes/models can you suggest please? A Dacia Sandero. £5,995. Hand cranked windows, no radio, no (standard) spare wheel. That's as basic as you can get. But you can up-spec even a Dacia to up to £16,500. What you can't have is a high quality basic car without any of the gizmos. A problem has developed with my 2012 2.2d Jaguar XF. After sitting in traffic, the ECO mode engages. When I pull off, the car stalls and the transmission locks up. I have to wait 2 or 3 minutes for the transmission to re-engage and turn itself off before I can restart the engine. At this point the ECO warning light on the dash comes on showing it is disengaged and when I try to re-engage it indicates there is a fault with the ECO system. The next time I drove the car the warning light has disappeared. I took the car to my local Jaguar dealer and he ran a diagnostic check and could find no fault codes. They suggested monitoring the situation and to call if the problem persists. After that visit I drove the car with the ECO system turned off from the beginning of my journey and there was not a problem. I then drove the car with the ECO system on and the fault reoccurred. I advised my dealer and he is due to run some more tests next week and has said it might need a new transmission (c. £10k). The car has only done 23,000 miles since Nov 2012. Have you come across this problem before? Is there an easy fix or is this going to cost me a lot of money? Since sending the above email the dealer ran some more tests [keeping my car overnight]. He has now diagnosed that there is a fault with the Control Module (part of the gearbox) and has advised that I need a new transmission, stating this problem will get progressively worse until the unit fails completely. Jaguar Customer Services were contacted both by myself and the dealer and after review they decided to offer to pay for 50% of the cost as a gesture of goodwill. My share of the bill will be £4,650 including VAT. I have been offered a trade in value of circa £13,200 by Webuyanycar.com. The decision I now have is whether to repair the car and keep it for a few more years or sell? However, I am concerned if I sell the car I will have to legally declare the fault, in which case the value will fall substantially. Should I just bite the bullet and spend the money given that it is now going to be difficult for me to sell the car because this fault is now on file at Jaguar? I have driven Jags for the past 15 years and don’t really want to change the brand. I ultimately want my next car (which will take me into retirement) to be a petrol F-Pace or E-Pace and was hoping to wait until there was a good choice of 12 month old models on the market (which will probably be in a couple of years’ time). Your valued opinion would be appreciated. In July, my BMW 5-Series caught fire as I pressed my key fob to open it. Smoke started to billow out of the boot where the battery is positioned. This was a car that was only 5 years old, and had only 28,000 miles on the clock. Maybe not under BMW's standard 3-year warranty, but not exactly what you expect from a relatively lightly used car that was otherwise running perfectly well. The car was taken to the local BMW dealer in Croydon, who were themselves shocked to see such a fire occur in a BMW like this. All the electrics had been fried, the boot was a burnt out wreck and, with the acrid smell of smoke pervading every surface, they believed it would be a write off. This was confirmed when a BMW UK representative visiting and inspected the car, and indeed when an independent expert appointed by my insurance provider, Admiral, inspected it. The independent expert confirmed that there was a fault with either the battery or the battery connection, and that was what caused the fire. I naturally picked up the phone to BMW to see what they thought of the situation. Rather surprisingly, they completely stonewalled me. They said that, unless it was proved that there was an original manufacturer defect, they wouldn't accept any liability for the fire. Luckily my insurance provider, Admiral, gave me fantastic customer service and paid out the value of the car in full. However, I still was without a car for a couple of months, will undoubtedly face an increase in future insurance premiums, and most importantly, was quite close to being caught up in an explosion. On further investigation, it appears that BMW 5-Series models just one year older than mine were recalled at the start of 2012 for example the same issue that my car had, as can be seen from the link below: http://www.dailymail.co.uk/news/article-2120703/BMW-recalls-100-000-models-battery-problem-cause-fire.html / What I find odd is that BMW appeared not to take this obvious safety issue seriously at all, and have (in their words) no intention of even considering issuing a recall to 2012 models of 5-Series cars. Whilst it's been a hassle to deal with BMW's appalling customer service and ultimately only slightly financial detrimental to me, my main concern is how BMW appears to be able to take no liability for 5-year old cars exploding for something that is an obvious issue, and a repeating issue at that. I've notified the DVSA of what I believe to be a serious safety defect, and the lack of responsiveness by BMW in treating this case seriously. Could you let me know your views on this? Having accepted the insurance payout from Admiral, have I lost all ability to pursue BMW for compensation? How else can I hold BMW to account and make sure this doesn't happen to anyone else? The Daily Mail shock story concerns the previous model E61 5-Series, not your car, and is widely documented: /carbycar/bmw/5-series-e60-2003/?section=good / These cars with build dates from 2006 to 2010 were all subject to a DVSA Vehicle Safety Recall. If your car is 5 years old, it's an F10: /carbycar/bmw/5-series-f10-2010/?section=good / There has not been a recall of this model. However, what could have happened is that water got into the boot, arced across the battery and that started the fire. I agree that, because BMW had a major problem with the previous model 5-Series the company should have been concerned about what happened to yours, but, on the basis of reader feedback on the F10, this seems to have been an isolated incident.